How often do you eat beets?I bought this bunch of beets after I don't know how many months.Often times we avoid beets because of the mess it creates or out of ideas to use them in our daily meals.What ever might be the reason,think again,this gorgeous vegetable of the Mediterranean origin is considered a powerhouse of nutrition from root to its leaves.Raw beet juice is said to be good for treating some form of cancers.The good source of folate can prevent birth defects in pregnant women.The leaves are next only to spinach in its nutrition. Not very practical to eat them raw,but there are numerous ways to incorporate this wonder veggie in your daily meals.In the Series 1 are the recipes with Beet Puree,which are sure to change your perspective about cooking with beets. Rinse the beets under cold water.Transfer them to pot or pressure cooker,fill in water until all the beets are completely immersed.Cover and cook on medium heat,takes about 40-45 minutes in a pot and 20-25 minutes in a pressure cooker to be fork tender. Drain all the water,peel ,slice and serve in salads or soups .Or add 1/2 a cup of water and puree in a blender,can be used in gravies,baking breads,muffins or in parathas(flatbread) and pancakes. Preheat Oven to 400F. Lay beets on a sheet lined with aluminum foil and coat with little olive oil and let bake for about 35-40 minutes until tender. Let cool for 10 minutes then peel and chop or slice. Make the syrup by reducing the juice with sugar until half its original quantity. sift together the flour, baking powder,baking soda and salt in a large mixing bowl.Add in the puree,milk and combine well using a whisk until smooth free of lumps. Heat non stick pan on medium flame. Grease it lightly with oil . Pour one ladle of batter drizzle about a little oil all over and wait for a minute before flipping and let it cook for another minute.Repeat the same for the rest of the batter.Stack the pancakes and drizzle the syrup and enjoy! I usually serve this to my toddler,but really any body who loves to start the day with a bowl of oatmeal should try flavoring with beets,for added nutrition. 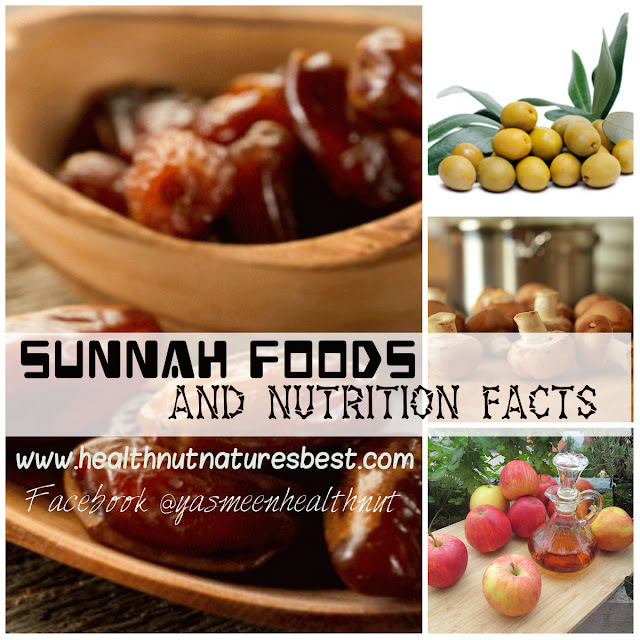 A handful of any preferred dry fruits and nuts. Bring the water or milk to boil in a small saucepan,add the oats,cook as per the package instructions.When cooked ,turn off the heat,mix in the beet puree and serve with a drizzle of honey and sprinkle of dry or fresh fruits and nuts. 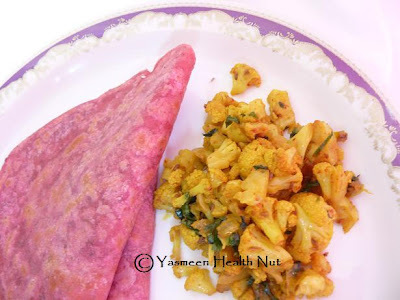 I got this brilliant idea of adding beets in parathas from Dershana's recipe,a delightful nourishing variation for a family that eats parathas for 2 meals of the day. Prepare the dough:Add all the dry ingredients in mixing bowl,combine them. Make a well in the middle pour in the water ,beet puree and oil. Mix until the dough is smooth ,knead for couple of minutes and let rest for about 10minutes before rolling in to parathas. Rolling and Roasting the Paratha:Divide the dough in to about 10-12 portions and roll in to balls. Sprinkle a little flour(I prefer All purpose flour) on the rolling surface. Use a rolling pin to roll them in to round parathas.See here for a pictorial paratha recipe. Preheat an iron pan(Tava) or non stick pan at medium high flame. Roast the parathas flip once and spread little bit of oil and flip again after few seconds. For softer parathas use a spatula or a kitchen towel to lightly press and roll them around the pan. Parathas are ready to serve when slightly brown on both sides. A curry in a hurry is perfect with these parathas. 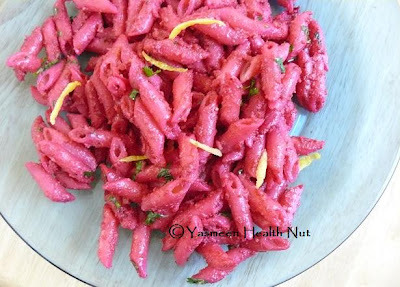 How could I resist the pretty in pink pasta recipe of another Healthnut, Bharti.The zesty pasta became instant favorite of my boys.The elder one was a little reluctant,the big guy knows pink is meant to be for girls,but after having a bite quickly changed his mind in favor of this pink food. I excluded dairy from the recipe and used almonds instead. 2 tablespoon fresh herbs like cilantro or parsley,finely chopped. Heat the oil on medium heat,add the onions,saute for 3-4 minutes until lightly brown,add the garlic ,saute another minute.Add the almonds,beet puree,salt and the pepper,stir in 2 tablespoons of water allow the mixture to warm up ,then mix in the cooked pasta.Finally add in the herbs,lemon juice and the zest ,combine well and serve. Well after not buing for months you have been indulging in them. I never have cooked fresh beet, i do buy often, which you can get them in bottles and use them in my sandwithces. I love the colour of the dishes. Good menu and good food. Congrats! 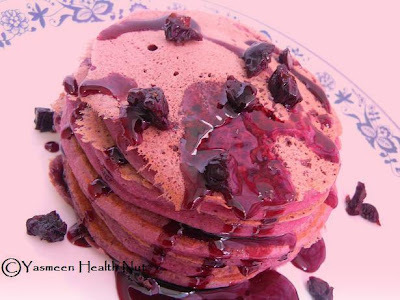 Oh beet pancakes :)?I'd never come up with the idea. Hat's off to you Yasmeen for all these innovative ideas! Very intresting stuff. I buy beets often and have them atleast once a week. Will try out these. 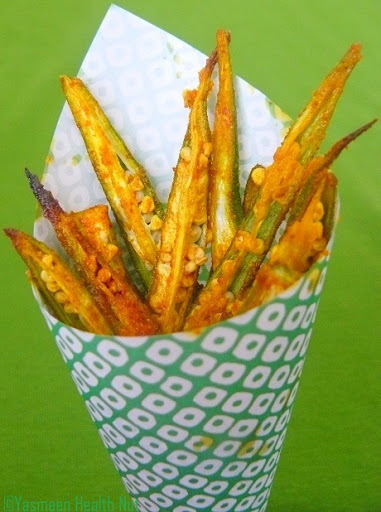 Truly innovative..All of them are interesting..me usually end up with dry fry or some with curd..
Tasty treats!! Yasmeen, you made me feel really guilty asking that first question!! I hate beets and have them maybe once in two months that too because I suffer sever guilt pangs:) It is truly a nutrition powerhouse and I love Bharti's pink pasta too!! WOW!!! Lovely ideas..I especially loved Beet Pancakes the most..
Just wanted to share...been waiting to make that pomegranate ice-cream..after few days when eventually I could not find pomegranates I ended up using beet instead..(yes we don't get pome too over here..sigh)..it turned out great though:D...also made your Apricot Trifle..simply awsum! We buy beets each week, everyone loves it at my place. I usually make a subzi or parathas. Loved the idea of pancakes. Will surely try them soon. Never seen so many uses for beets. personally I like beets very much for its color and sweet taste. But never went beyond stir fry and salad. we arent as creative with beets as you have been - in crete, we usually eat them as a salad, either boiled or in a yoghurt sauce. wow Yasmeen so many beet dishes. All dishes looks mouthwatering & healthy too..
Wow, lots of great dishes with beets! Everything looks so good! OMG, Yasmeen am speechless, wat a lovely array of rose dishes, i love specially the beet oatmeal, very creative!! 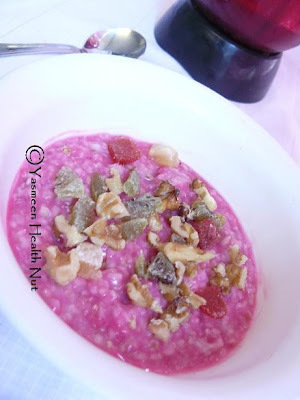 !Thanks for sending FIC..
Love the dishes,very healthy and delicious.Love the pink pasta and he oatmeal esp.I usually stick to traditional beet recipes,but never ever tried atleast one of these.Too perfect and too good Y.You have given an entire menu. Pink everything! You really went all the way Yasmeen. I esp. love the pancakes. I'm gonna make them the next time I pick up beets. The kids will be so psyched with pink pancakes. Thanks a bunch. Wow so many lovely beet recipes! The pancakes must be a sure winner with your kids and its good for them too :) I usually have oatmeal in the mornings...thanks for the healthy idea of adding beets to oatmeal Yasmeen! All beets recipes.. looks so gud an healthy.. tempting pics !! The color looks so beautiful! Lovely ways to include beets. Liked the pancake very much. Even I have a similar post on beets. Will post it soon. Lovely array yasmeen! I cook regularly with beets, love them...in fact I've even made a cake with beets..and no one knew! I'll definitely be monitoring this series. I am yet to try cooking with beets. I liked the beet pancakes idea. 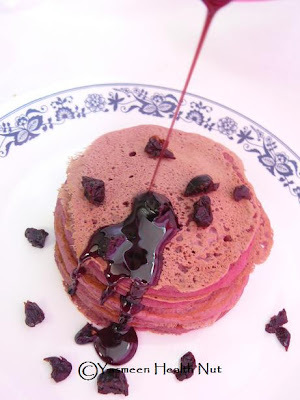 I love to have pancakes as my weekend breakfast and adding beets to the batter is really an innovative and delicious idea! hey, the beet pancake looks yum. The picture of the pancake looks great! Wow.. thats a lovely pinky spread... Pancakes are fabulous! Y'know, I always thought nothing could "beat" (sorry) my beet risotto BUT I stand corrected ... your beet creations look way more interesting and innovative than mine. KUDOS Yasmeen!! All the receipes are mouthwatering and creative. Awesome click as ususal. simply brillient and so pretty pink colours. 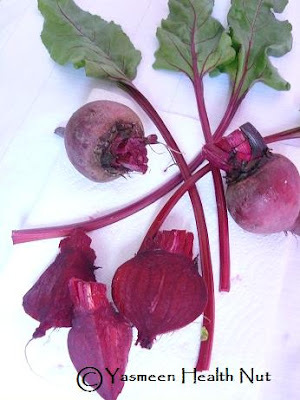 thanks yasmeen for informative post on beets. yummy post yasmeen,..loved all of them,..:-),..u r so innovative,.. So many Innovative items with beet!!! Look at that beautiful color......only recently I have started to enjoy beets.....everything looks delicious and beautiful. I like raw shredded beets but after overindulging one year I can't stand pieces of cooked beet. The pasta with lemon and almonds sound great! 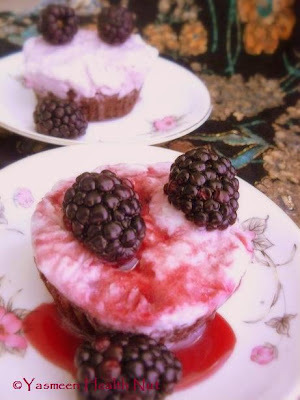 I haven't tried beet puree yet and this looks like a great dish. Everything looks delicious. I have a couple of beets in the refrigerator and I was wondering what to do with them. I'll try the pasta first. I love that you love beets! I am always looking for new ways to use them...I will certainly be trying your beet, almond and lemon pasta which looks particularly pretty! It's amazing to pay a visit this web page and reading the views of all mates concerning this article, while I am also zealous of getting know-how.